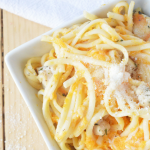 You will love how flavorful, rich and creamy this butternut chicken fettuccine alfredo is and how easy it is to cook. A new family favorite for sure! Dice your chicken and place it in a pan with a drizzle of olive oil, salt and pepper, and the parsley. Cook until no longer pink in the middle, set aside. Place your linguine in a pot of boiling water and add a drizzle of olive oil and salt to the water until al dente. Drain and set aside. Place your butternut squash in a pot of boiling water and boil until soft. Drain and add it to the pan with the chicken. Add you heavy cream, salt and pepper, and parsley to the pan. Allow to simmer for about 15 minutes or until thickened. If not quite thick enough, add a teaspoon of corn starch. Pour your sauce over the linguine in a large bowl and mix it carefully with tongues. Place the parmesan cheese in the bowl while mixing. Best served hot.